Buyers and sellers of homes in Scotland are rushing to close deals before the first new tax in 300 years imposed by a government in Edinburgh takes force in April. The regional parliament approved the tax on property transactions using powers granted to it by the U.K. prior to Scotland’s failed bid for independence in September. The levy hits buyers of expensive homes the hardest, while sparing Scots purchasing the cheapest housing. “I’ve already had phone calls from people wanting to accelerate the process to make sure that their property is sold prior to April,” Edward Douglas-Home, a partner at Knight Frank LLP’s Edinburgh office, said on Oct. 10, the day after the rates were announced. The nationalist government’s plan, designed to reduce inequality, replaces a U.K. duty that Scotland’s finance secretary called “unfair.” The Scottish law will boost taxes by an average 56% for buyers, according to a calculation by realtor Savills Plc. The higher costs, in combination with U.K. mortgage restrictions, threaten to hobble the housing recovery in Scotland, where price gains have slowed this year. “The cost of transacting property is going to go up in Scotland and all else being equal, you’d expect that to dampen the market and lead to less liquidity,” saidEd Stansfield, chief property economist at Capital Economics in London, who has worked as adviser to the U.K. Treasury. Finance Secretary John Swinney said on Oct. 9 that the Land and Buildings Transaction Tax, which takes effect April 1, will help 49,000 buyers at the lower end of the market. Purchasers of homes costing 135,000 pounds (S$275,500) or less will incur no tax at all. The rates for Scots paying the levy apply to the portion of the home’s value that falls within different bands: A 2% on values up to 250,000 pounds; 10% up to 1 million pounds, and 12% on homes worth more than that. Swinney announced the rates as part of his budget for the next financial year. While the tax law was passed last year, the bands are still subject to approval by parliament, where the Scottish National Party controls the majority. The current U.K. Stamp Duty is a “slab” tax, in which a single rate applies to the entire home price. It starts at 1% for houses between 125,000 pounds and 250,000 pounds, rising to a maximum 7% on properties worth more than 2 million pounds. Savills Research said the change would increase the tax on a 363,000-pound Edinburgh average family home to 13,600 pounds, or 25%. Taxes on a home valued at 450,000 pounds would increase by 65%. Scotland is imposing the tax after the Bank of England moved to restrain soaring home prices in the U.K., primarily in London, where values have climbed more than 50% in five years. The BOE placed limits on mortgages worth more than 4.5 times a borrower’s annual income and required lenders to reject loans for buyers who fail a stress test that assumes an immediate 3 percentage-point increase in the benchmark interest rate. The standard variable rate in the U.K. was 4.45% on Sept. 30, up from 4.35% a year earlier, according to the BOE. The yield on 10-year government bonds was 2.20% today, down from 2.63% a year ago. Mortgage lending has been growing in Scotland this year. U.K. lenders granted 28,600 home loans in Scotland in the first half of this year, an increase from 23,800 in the first two quarters of 2013, according to data from the Council of Mortgage Lenders. That’s down from 104,900 in all of 2006, before the global financial crisis the following year. The housing levy was authored by the SNP-controlled government. The party won a landslide victory in the 2011 parliamentary elections that paved the way for the vote on its flagship policy of independence. The parliament had been re-established in Edinburgh in 1999 after being disbanded in 1707 with the Act of Union that formed the U.K. The semi-autonomous government has power over health, transportation and education, while most taxation, along with foreign policy and social welfare, is controlled from London. The U.K., in a bid to appease nationalists, gave Edinburgh authority over some tax policy, such as housing, two years ago. In the referendum for independence, 55% of Scots opted to remain part of the U.K. as Prime Minister David Cameron and the main U.K. political parties pledged to cede more power to Scotland, including over personal income tax. The “no” campaign targeted Scotland’s future currency by ruling out sharing the pound with an independent state. That raised the possibility of Scots having mortgages in a currency they didn’t get paid in. The property levy fits the SNP’s agenda of helping lower-income Scots in the face of benefit cuts by the government in London and expected proposals for tax breaks for wealthier earners by Cameron ahead of the 2015 U.K. election. Invoking economist Adam Smith, who developed his theories and lectured at Edinburgh University, Swinney, the finance minister, said the new regulations were based on the principle “that taxes should be proportionate to the ability to pay.” The levy will ensure “certainty, convenience for the taxpayer and efficiency of tax collection,” he said in an e-mailed statement. 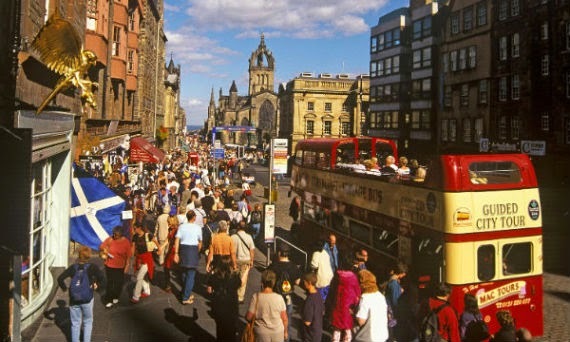 Edinburgh, Scotland’s financial capital and home to fund management companies overseeing at least $800 billion, accounted for more than half of all sales valued at 1 million pounds or more in the first six months of this year. House price gains have been slowing in Edinburgh this year. The average value of a home was 220,174 pounds after an annual rise of 3.6% in the July to September period, the ESPC law firm group said in its report last week. That compares with a 5.6% gain in December through February. Nationwide, housing sales have been expanding in fiscal 2014. The total value of residential sales was 13.8 billion pounds, 22% more than the previous year and the highest since the height of the previous boom in 2008. The value is down 7.4% compared with 2004. Realtors said they expect the new tax to slow the market by making it harder for prospective buyers to save enough for a down payment and secure a mortgage. Douglas-Home of Knight Frank said purchasers will look to have some or all of the costs absorbed by reductions in housing prices. “It’s going to significantly reduce their ability to spend,” he said. No Comment to " First Scottish tax on housing purchase in 300 years looks to cool market "